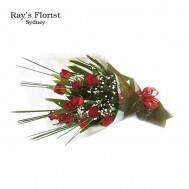 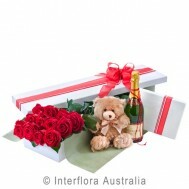 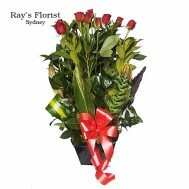 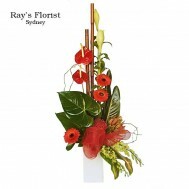 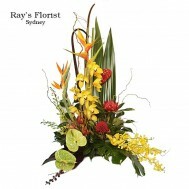 a large design arrangement of exotic blooms consisting of singapore orchids/anthiriums/birds of paradise/cymbidium orchids/waratahs when in season/red silvans/torched willow ..
large arrangement in a ceramic pot of 12 long stem red roses with lovely foliages ..
bouquet of 12 medium length lush red roses with babies breath or berries with foliages gift wrapped ..
One dozen long stemmed red roses in a presentation box with a bear, a bottle of sparkling wine and a box of chocolates .. 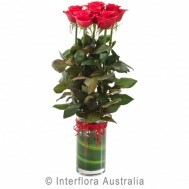 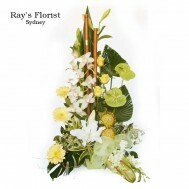 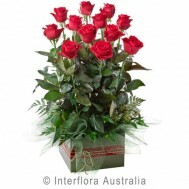 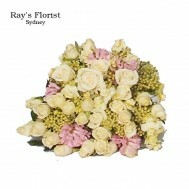 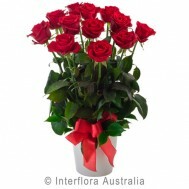 Dozen long stem roses in a ceramic pot ..
a large ceramic pot arrangement in soft shades of mint/lemons/whites consisting of anthiriums/cassa blanca lilies/gerbera's/roses/cymbidium orhcids/ november lilies/geraldton wax/bamboo and exotic foliages .. 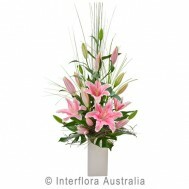 Elegant arrangement of oriental lilies in ceramic vase ..
soft pastel posy bouquet of roses/hyacinths and seasonal berries ..
bouquet of 12 medium red roses and babies breath with lovely foliages gift wrapped ..